Habitat Education Center in Belmont has a new Electric Vehicle Charging Station, the second at a Mass Audubon wildlife sanctuary (Joppa Flats in Newburyport has the other). Electric Vehicles (EVs) are great tool for fighting climate change and reducing carbon dioxide emissions from vehicles. Even when charged by electricity generated from coal, EVs are responsible for fewer heat-trapping carbon dioxide emissions into the atmosphere. In Massachusetts, they are better still, since our electricity comes from greener sources. At Mass Audubon wildlife sanctuaries, all of our electricity is either generated by our own solar panels or purchased from renewable sources, so charging your EV at Habitat is about as clean as it gets. EVs are cheaper to own over the lifetime of the vehicle, since they require less maintenance, include fewer moving parts, and are by many assessments more reliable. There are two primary reasons there aren’t more EVs on the road right now. The first is EVs cost more up front. In Massachusetts, there are a number of incentives that can reduce the purchase price to less than that of a comparable gasoline-powered car for a private buyer. The second barrier to EV ownership is a lack of charging stations. Businesses and organizations are hesitant to install charging stations without a steady stream of EVs to use them, but drivers are hesitant to buy EVs until there are more charging stations to recharge. Something needs to break the cycle, and that’s one reason why Habitat and other sanctuaries are looking into installing charging stations. Belmont Municipal Electric Department installed electric service for the station free of charge! The charging station is located at the edge of the Habitat parking lot near Juniper Road. 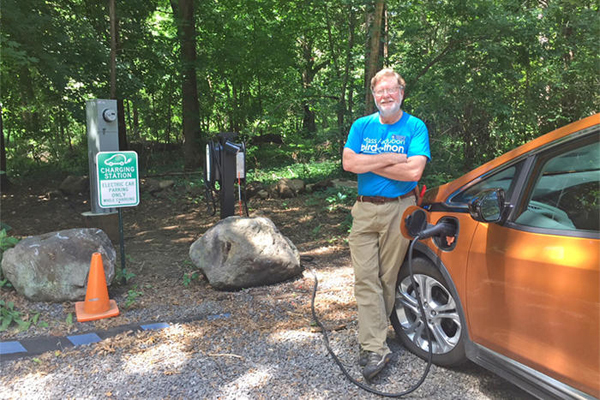 Sanctuary Director Roger Wrubel, who drives and EV himself, wants to inspire others to use the charging station, so there is currently no fee for visitors that recharge. This entry was posted in Climate, General, Going Green on July 3, 2018 by Daniel Brown. Thanks beloved Ma Audubon! I did charge briefly at Joppa Flat this past summer and am planning a ” green ” trip in December and will head there again. I bought a Chevy Bolt in early 2017, I have 33 solar panels at my home. Trying to decrease the footprint ( ie:vegetarian , no straws or plastic bags.) the IPCC report that give us 12 years to get our act together, this is not a surprise and especially under the current ruler is terrifying. Thanks Ma Audubon for all you do and have done. I love you and am a member of the Tern Society. Awesome! I would support one at Arcadia. I own a Chevy Volt in Westfield. Best decision I ever made. I drive 40 miles to Berlin, CT and can charge at work. I use no gas driving to and from work in the summer because I keep half of my commute to backroads. I agree with your comment about breaking the cycle between not enough EVs and not enough chargers. Great job!